If you pray and wear your underwear inside out, will your team win the big game? Two weeks ahead of the Super Bowl, half of American sports fans say they believe God or a supernatural force is at play in the games they watch, according to a new survey. That percentage includes Americans who pray for God to help their team (26 percent), think their team has been cursed (25 percent) or more generally believe God is involved in determining who wins on the court or in the field (19 percent). Overall, half of Americans fall into one of these groups, according to the survey Public Religion Research Institute released Tuesday. 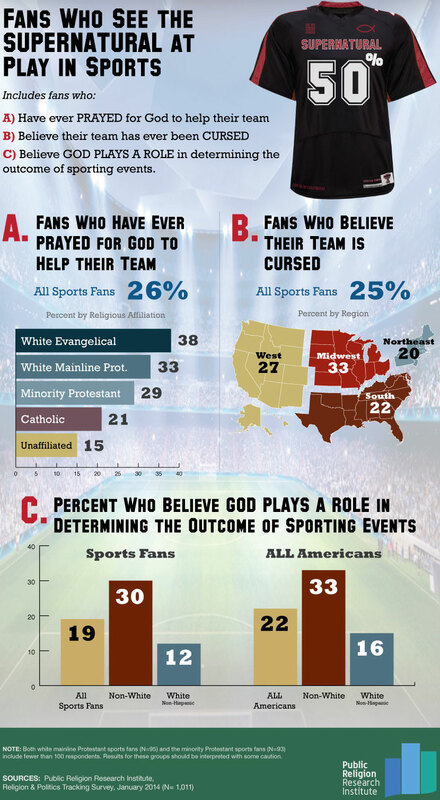 Football fans were the most likely to pray for their own teams to win, with 33 percent saying they ask God to intervene in games, compared to 21 percent of fans of other sports. They were also more likely to think their teams were cursed (31 percent compared to 18 percent) and to take part in rituals before or during games (25 percent to compared to 18 percent). PRRI, which found that about 7-in-10 Americans said they are likely to watch the Super Bowl, also found football to be by far the most popular sport. Football was four times more popular than baseball, basketball, soccer or ice hockey. On the average Sunday, a quarter of Americans said they were more likely to be in church than watching football, while 21 percent said the opposite. About one-in-five said they're likely to do both, while one-third said they're not likely to do either. Overall, about one-fifth of sports fans said they perform a ritual before or during games of their favorite teams. The majority of those fans, 66 percent, said the rituals involved wearing jerseys or clothing with team colors. One fan responded to a survey question on rituals by saying he or she wears "a dirty pair of underwear ... over my pants and then I put my jersey on." About a quarter of respondents said their rituals involve a physical activity, such as dancing in a circle, sitting in the same seat for each game or giving a "pep talk" to the television. Just as they were divided on whether God has a role in sports games, Americans also were divided on whether God rewards religious athletes with health and success. Forty-eight percent of Americans said God does reward athletes this way, but 47 percent disagreed. The belief that God will help religious athletes was most prominent among white evangelicals (62 percent) and non-white Protestants (65 percent). A little more than one-fifth of the religiously unaffiliated held the same view. The survey, which was conducted via phone in Spanish and English between January 8 and 12, took responses from a random sample of 1,011 adults. It had a margin of error of 3.1 percentage points.